Table is 36” tall, 40” wide and 17” deep. Accompanying Wall Mirror is 42” tall, 37” wide and 3” deep. 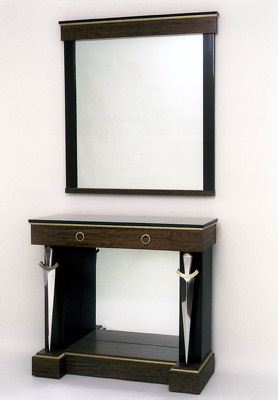 Australian Black Bean wood, black lacquer, Spanish black marble, 23 Karat gold leaf molding, mirror, handmade brass drawer handles, handmade swords of polished aluminum and brass.